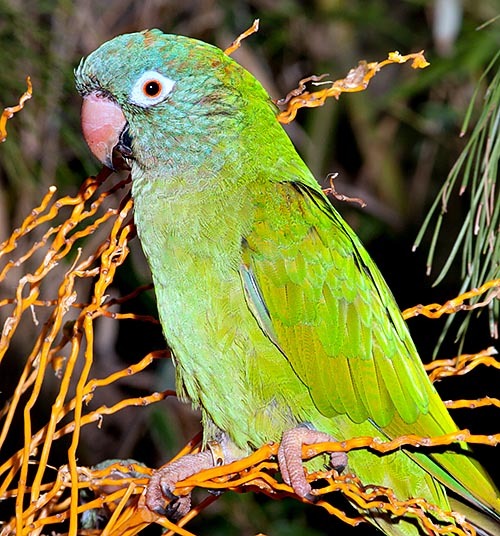 The Blue-crowned Conure (Aratinga acuticaudata Vieillot, 1818), is a parrot afferent to the order of the Psittaciforms (Psittaciformes), family of the Psittacids (Psittacidae). 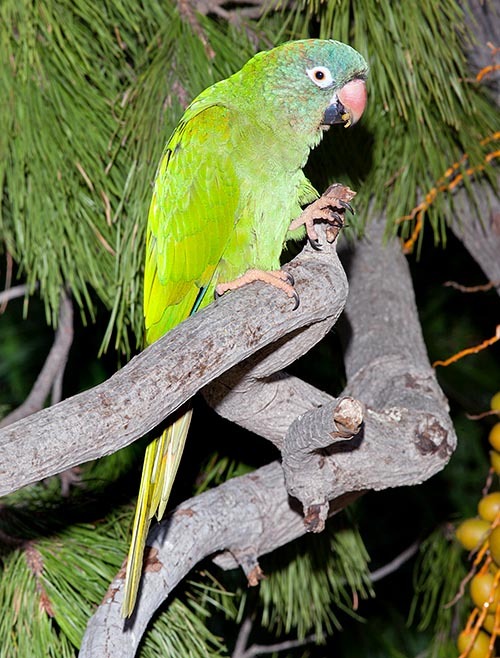 The name of the genus “aratinga” in the local language, in South America, is the diminutive of the well known genus Ara, to which in its whole, especially for the colour, this parakeet resembles. The suffix “tinga” for the locals has also the meaning of white, and therefore there s perhaps a reference to the white ring around the eyes. The name of the species “acuticaudata” comes from the Latin “acutus” = acute, pointed and “cauda” = tail, due to the sharp feathers of the tail. Concluding, the scientific name tells us that this is a small ara with the sharp tail. It is present in Venezuela, Argentina, in north-eastern Colombia and Brazil, in eastern Bolivia and in the western part of Uruguay. It frequents the arid and semi arid deciduous forest. It is often sighted on the palms belonging to the genus Mauritia, in the arid zones of Venezuela characterized by sparse thickets, and in Colombia in the grassy savannahs of the Orinoco plains, in the open forests of Argentina, in the “pampas”, in the Bolivian deserts up to the highlands around the 2000 m above the sea level in the woods of Leguminosae and Cactaceae. It is also present in the cultivated areas and in the pasturages of the dry forest. Of around 35-38 cm of size, 160-170 g of weight, general colour green, pale blue face and front, bare and white ring around the eyes, brown beak with black tip and orange iris. In the juveniles the blue of the front is limited to the front and the crown, the blue of the chest is always absent. The various subspecies differ only slightly in the intensity of the colouration, with small variants in the extension of the blue. 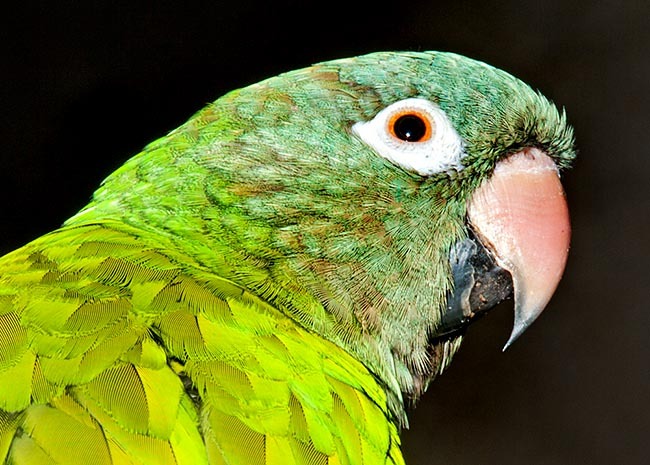 The blue-crowned parakeet lives in pairs or in small flocks. Where the food abounds, it may be also very numerous and causes often remarkable damages to the cultivations of cereals or of fruit trees like the mango. In the savannahs, it nourishes of the fruits of the “mastranto” (Hyptis spp.) and of the Condalia lineata. In Colombia, the peak of the breeding season is the month of April, but in the remainder of South America it stands astride this month. In Uruguay and in Argentina, the marriages take place in December, in Venezuela, between March and July. For the nests it utilizes the very top cavities of the trees, including those of the cultivated species such as the mango and the guava. In Margarita Island, the subspecies Aratinga acuticaudata neoxena, spawns exclusively in the cavities of a mangrove, the Avicennia germinans. At times it nidifies also in the cavities of the rocks. It spawns two to four eggs which it incubates for 26 days. The staying in the nest of the young is very short, at most 45 days, because it is a species which may reproduce even three times per season. As a consequence, it is a much diffused species with at very low risk of extinction. In captivity, they are bred in standard net-boxes, of 30 x 30 x 45 cm. The entrance hole must have a diameter of 8 cm and on the bottom is to be laid some chip for a thickness of 2-3 cm. It will be then the pair who, frequenting the nest before the spawning, will dig, carrying up to the borders the chip necessary for getting the bottom comfortable and cozy for the female and the eggs. The Aratinga acuticaudata when in captivity nidifies once a year, rarely twice. In Italy the reproductive period begins by early May and once the spawning of the last egg has happened, the hatching begins. The eggs are usually two to four, released at intervals of two days between them and this happens in the afternoon. The incubation lasts, as an average, 23-24 days. Around the eleventh day, the chicks open their eyes and weigh about 45 grams and when three weeks old they complete their plumage. They leave the nest after about 57 days. By the beginning of their flying away they have the iris of the eyes of pale brown colour and the beak is grey. They will complete the adults’ black-horn colouration after one month. They are animals difficult to acclimatize for reproduction purposes due to their nervousness, but if hand-reared, they are meek, amiable and good repeaters of words, with an average repertoire of sounds. The systematists distinguish the following subspecies: Aratinga acuticaudata acuticaudata, present in Bolivia, Brazil, northern Argentina and western Uruguay; Aratinga acuticaudata neumanni, present in the Bolivian Andes; Aratinga acuticaudata haemorrhous, present in north-eastern Brazil; Aratinga acuticaudata koenigi, present in northern Venezuela and north-eastern Colombia and Aratinga acuticaudata neoxena, present in Margarita Island and in Venezuela.